TV Times, 3 January 1964, page 13, Viewerpoint, Letters Page, England. Honor Bright. 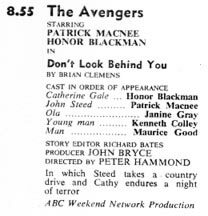 HONOR BLACKMAN'S performance in The Avengers episode, "Don't Look Behind You," was electrifying and one I will remember for a long time. Miss Blackman deserves a Television Oscar for it. (MISS) L. HARRISON, Hanstead, Birmingham, 22A.